Making a purchase is very simple. Just browse through the catalogue, click on any items that you wish to buy and put them into the shopping cart. Once you have finished your selection, click on checkout to process your order. We accept Paypal, Postal Orders and Cheques. Postal orders and cheques are for UK customers only. Please include with your payment the order number given to you upon completing checkout. All credit card payments are made via PayPal and are conducted off this website on their secure servers. 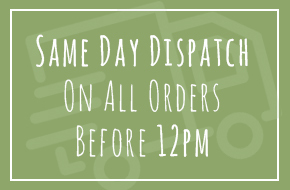 Most orders (excluding orders shipped by myHermes) will be dispatched same day if placed before 12:00 (or next day if placed later). If a product is unavailable and not shown as out of stock we won't delay your order (UK only), we'll send the owing product as soon as it comes back in to stock. We also reserve the right to delay your order if we are expecting a delivery. In both cases we will contact and advise you accordingly. We want you to be happy with your purchase but if any product is unsuitable, we are happy to exchange or refund within 14 days of receipt. If you wish to return your purchase(s), please let us know in writing (by email or post), within 7 days of receiving the goods. The goods must be returned at your expense, within 14 days of receipt in their original packaging, unused, in undamaged condition suitable for resale. If the error is ours (for example in the case of faulty goods or goods not as described), we will also refund return shipping. We will process your refund promptly, once the item has been received back by us. Any refunds will be made by the same method as your original payment. You are responsible for safekeeping of the item until such time as it arrives back to us. When returning items we recommend that you obtain receipt of postage from the Post Office as proof of postage. Our sole liability for items purchased is limited to the purchase price only. We accept no responsibility for any damages or costs arising from the item or its use, consequential or otherwise. Many thanks for your custom.